Hanoi (VNA) – Chairman of the Vietnam-Thailand Parliamentary Friendship Group Pham Dinh Toan met on August 15 with President of the National Legislative Assembly (NLA) of Thailand Pornpetch Wichitcholchai, who is on a visit to Vietnam. 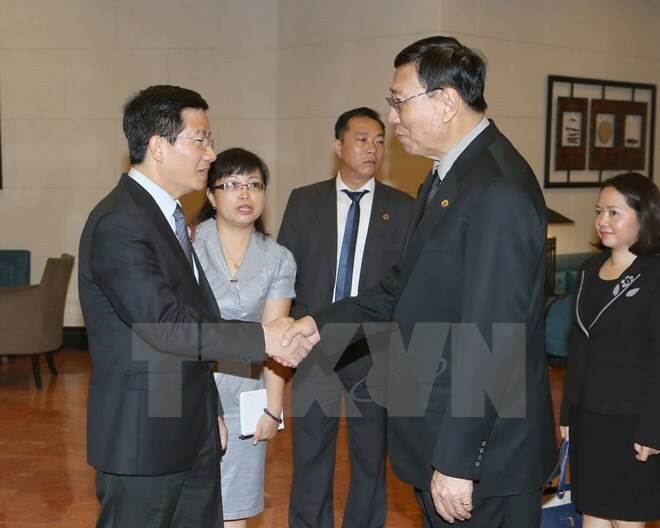 Toan highly valued the visit’s significance to the Vietnam-Thailand strategic partnership as well as the friendship and multifaceted cooperation between the two legislative bodies. He described it as an opportunity to build trust and understanding between leaders of the two countries and parliaments. Applauding the active and effective activities of the two parliamentary friendship groups, he said their cooperation has become an important channel of parliamentary diplomacy and a firm bridge helping to foster relations between the countries’ parliaments and people. He expressed his hope for the NLA’s continued support for cooperation activities of the two parliamentary friendship groups to share information about issues of common concern. At the meeting in Hanoi, NLA President Pornpetch Wichitcholchai said relations between the two legislatures have continually been reinforced. He added that he will help the parliamentary friendship groups to step up activities since they are critical factors in the development of bilateral parliamentary ties and Vietnam-Thailand relations.